Enamelware kitchen items have timeless appeal. As you browse in you local antique store or peruse items in an online auction, you might see vintage enamelware pitchers. These beautiful and practical items are as useful today as they were a century ago. Enamelware was extremely popular in the nineteenth century due to its affordability, durability, and beauty. To make enamelware, manufacturers create an enamel mixture out of superheated quartz, feldspar, metal oxides, water, clay, and other materials. This mixture was then cooled and compressed to eliminate excess water. The resulting product was similar to glass and was ground up and fused to a base material like tin, cast iron, or aluminum. Also known as "graniteware" or "agateware," vintage enamelware often features beautiful stone-like swirls and speckles. Look in your own kitchen cabinets, and check with family members. 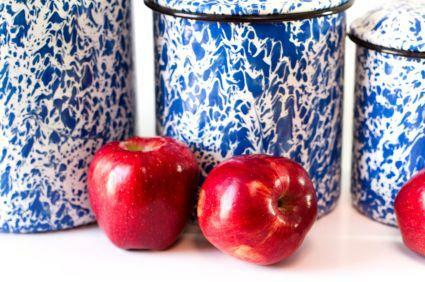 Enamelware items are often passed down through the generations, since they are so durable. Scan the wares at flea markets and garage sales. It may take some searching to find just the right enamelware pitcher in these settings, but you'll get a great deal. Browse the selection at your local antique shops. Remember that antique sellers will often negotiate on the price of an item, and enamelware pitchers are no exception. Keep an eye on online auction sites like eBay. This is a great way to find affordable enamelware pitchers. Check out online antique malls like Ruby Lane. You might be surprised at what you can find on these sites. Use enamelware pitchers in the kitchen to serve condiments and drinks. Fill your pitcher with sand or stones and use it as a bookend or doorstop. Display cut flowers in your pitcher for a fun country look. If your pitcher is in less-than-perfect shape, you can use it as a planter. Carefully examine enamelware pieces for rust. If the outer layer of enamel chips away over time, the underlying surface is vulnerable to corrosion from air and water. Examine how the piece is constructed. If the handle is riveted (rather than soldered) to the body of the pitcher, that can indicate that the pitcher is quite old. Look for dents. Since many of these pitchers have been used for real kitchen tasks, you'll see signs of wear. This can add to the charm of the piece, but if you're looking for a pitcher in perfect condition, you'll want to thoroughly examine it for dents. Have fun! These vintage kitchen items are as useful as they are beautiful.